Are you ready for all the romance of Valentine’s Day? We certainly are! In anticipation of sharing a special meal with a special someone, we’re pleased to name the 100 Most Romantic Restaurants in America 2017. These awards reflect the combined opinions of more than 10 million restaurant reviews submitted by verified OpenTable diners for more than 24,000 restaurants in all 50 states and the District of Columbia. 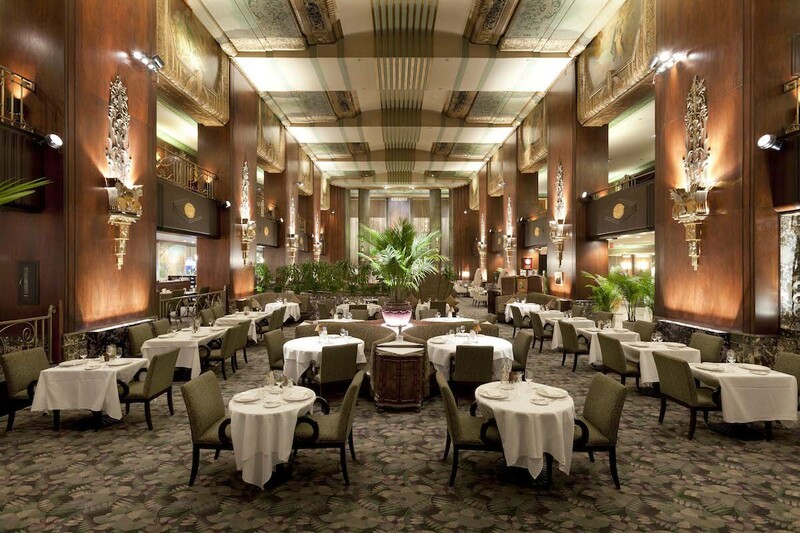 Highlighting winners in cities both large and small, the complete list features restaurants in 36 states and includes Fearrington House Restaurant in Pittsboro, North Carolina, The Inn at Little Washington in Washington, Virginia, and Orchids at Palm Court in Cincinnati, Ohio (pictured). Proving Virginia really is for lovers, the state boasts 13 winning restaurants, followed by Florida with 10 and Ohio with eight. California, Colorado, and North Carolina have seven each, Texas has six, New York and Washington each have five winners, while Nevada has four. Arizona, Illinois and South Carolina earned three apiece. Indiana, Maine, Massachusetts, Michigan, Nebraska, New Jersey, and Pennsylvania all have two standout restaurants. Alabama, Delaware, Georgia, Hawaii, Kansas, Kentucky, Louisiana, Maryland, Missouri, New Hampshire, New Mexico, North Dakota, Oklahoma, Oregon, Rhode Island, and Tennessee are also represented. Based on this methodology, the following restaurants, listed in alphabetical order, comprise the 100 Most Romantic Restaurants in America 2017, according to OpenTable diners. Read about the 100 Most Romantic Restaurants in Canada 2017 and enter our #ValentinesDishPics Valentine’s Day giveaway for a chance to win one of five $1,000 gift cards, and let us know which of the 100 Most Romantic Restaurants in America 2017 you have dined at here or over on Facebook, G+, Instagram, Pinterest, or Twitter using the hashtag #OpenTable100. Photo Credit Mark Bealer (Orchids at Palm Court). How you missed Altius, Pittsburgh, I can’t imagine. Super fine dining with romantic atmosphere, unbeatable service, one of the best views in the USA and food preparation to match their outstanding menu. Check it out here on Facebook. I usually delete them as there is too much data to search for the city where I live. Most people won’t go all 100 restaurants. Rather, they go to the ones nearby. Why don’t you list them by the States? Sorting by the names doesn’t make sense. I realize much of this list is probably compiled by comments from diners, but one was totally missed in Charleston, which many feel is #1. That is Zero George. Worth a visit, very quaint, quiet, limited seating. Not one restaurant in the city of Los Angeles? Really? I am a avid user of OpenTable and absolutely love your App. How is it possible that not one restaurant in Los Angeles was not identified as romantic? I just celebrated 30 years living in Los Angeles and there are many romantic restaurants. Feel free to reach out to me. Apparently there are no romantic restaurants in Los Angeles? Have been to Wally’s Desert in Ranchp Mirage, CA. Soft lighting, live music, soft dancing, fabulous service, excelent food, candles, the best atmosphere. Truly wonderous! This is a good example of why uncurated popularity lists are useless. Sure there are some good romantic places, but not a single NYC or San Francisco or Philadelphia or Boston restaurant on here while there are multiple listings for Cincinnati and Omaha, several mediocre steakhouses, and (give-me-a-break) The Melting Pot, a chain of fondue restaurants with barely edible food. Chez Nous in Humble is an absolute hidden gem. The vast majority of the Houston area doesn’t know it exists, the interior is intimate, the food is exquisite, and the wait staff is incredible both in knowledge and professionalism. If you’re in the area and you’ve never tried it, you’re really missing out. We had an absolutely wonderful ‘tasting’ upstairs at Ristorante Massimo in Portsmouth, New Hampshire. We were looking for a menu with interesting appetizers and good wines and we found it there. The waiter made some great suggestions and we enjoyed every morsel. We will definitely go back. In Bosto/ Cambridge my top five are Amelia’s , TWFood, Hungry I, Carman’s, Erbulace & Fat Hen. These are all excellent. Nothing in Boston. MA.? So wrong! Super fine dining with romantic atmosphere, unbeatable service, one of the best views in the USA and food preparation to match their outstanding menu.Thanks For sharing information.